Les passionnés d'histoire pourront économiser des heures de temps et d'efforts par rapport à la navigation dans les transports publics en chinois avec ce service de transfert privé efficace de Datong. Cochez les deux temps forts culturels de Datong - les grottes de Yungang, vieilles de 1400 ans, et le temple suspendu de Hengshan - en une journée avec l'aide d'un guide local. Remarque: la visite ne comprend pas les frais d'entrée. Privé chauffeur met privégids was super!! Netjes afgehaald en teruggebracht bij treinstation. Gids sprak goed Engels. Veel achtergrondinformatie over de streek en het leven in China. Top!! This was the highlight of my trip to Datong! I came here during a Chinese National Holiday weekend and so it was extra busy. Viator connected me with Nancy beforehand and she recommended that I start earlier than the normal start time in order to manage with the crowds. Star was a very knowledgeable and experienced guide. The driver was also very good. I really enjoyed my day tour and my experience on this trip. 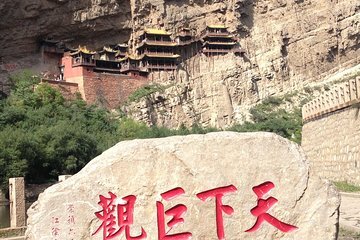 The hanging temple and the yungang grottoes are really special places and I'm so happy to have the chance to experience them.